One of the great things about PC gaming is that you can try out new games before purchasing. Lots of PC game demos are available for top PC games. They provide a free trial of the game, either with a few levels included, or alternatively, a time limited demo. As such, installing game demos is a good way to try out a new PC game. The PC even has its own ever expanding collection of freeware games which are full games that are freely distributed. Both PC game demos and freeware games are distributed for download via the Web, and there are a number of good websites to download them from. One website that is recommended for freeware games FreewareGames.net. 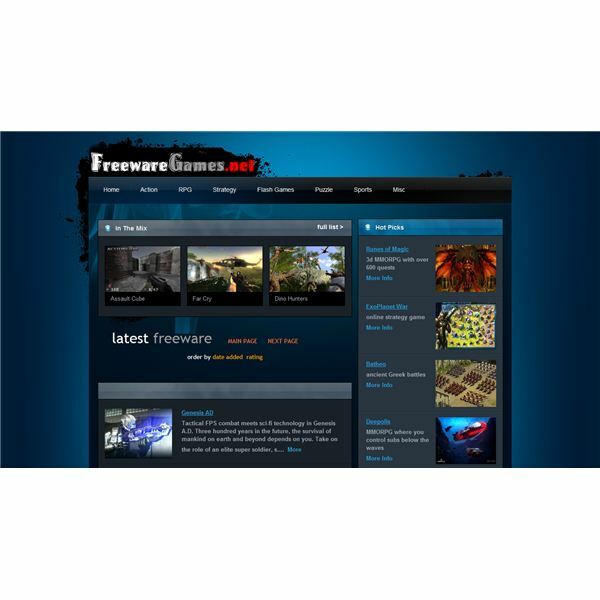 FreewareGames.net includes a variety of good freeware game titles for action, strategy, sport and RPG games and has straightforward navigation for browsing the site. The website includes links to websites where the game's can be downloaded from. Note that this can mean that a listed game is not available, if the original poster has closed the site or let the hosting lapse. Each game has a rating out of 10 included for it, along with a brief summary of the game title. Among some of the freeware games included are FreeCiv, BattleField Heroes, War Rock and Far Cry. In addition to this, the website also includes some flash games which do not require any download. The MegaGames website also includes an impressive variety of freeware games for download, as well as game demos. Under game files, select freeware to browse the website’s directory of freeware game titles which are listed alphabetically. There are some good freeware game titles here, such as my Scorched 3D, a 3D remake of an old DOS classic, and Mario Forever, which is a great Mario platform game spinoff. In addition to this, MegaGames also has a number of PC game demos for great, albeit a little dated, PC games, such as Call of Duty 4, Rise of Nations Thrones and Patriots, Company of Heroes and Civ IV. games this is one of the best download websites where you can find hundreds, possibly even thousands of freeware games. The website includes pages of action, adventure, simulation, RPG, sport and arcade games for download. All these games are reviewed and rated out of five. The website’s design also allows for straightforward navigation and a search box is included where you can input the game's title to search for a more specific freeware game. As such, Acid Play is a recommended website for freeware games. Do not forget the website of CNET, which remains one of the best software download sites there is. CNET has both a UK and US website which are both fairly similar in relation to content at least. From the homepage, select "downloads" and then "games" from the various software categories. Under the games category, there are thousands of game downloads for your PC. Each game has its own publisher description, editor review and screenshots. User ratings out of five are also included for the various games. To find a specific game demo you can also input the game title into the search box. Aside from PC games, CNET also includes a variety of software downloads for Windows and other platforms. The alternative way to find game demos and freeware software is to purchase PC magazines that include cover discs. PC magazines, such as PC Gamer, usually have free cover discs which include a variety of PC software, and some have a good number of PC game demos and freeware games that can then be installed from the DVD. The advantages of cover discs are that they may include game demos for some of the latest game titles and you will not need to search for them as you would online. In addition to this, the PC game magazine will likely include news, reviews and previews of the latest PC games. However, the disadvantage is that you will need to purchase the PC game magazine first, which makes the freeware a bit less free. You can find great PC game demos and freeware games at any one of the above listed websites. Or alternatively, PC magazine cover discs can also include a number of PC game demos for some of the latest games, and freeware games as well. To visit the above mentioned websites click the links included in the resources section below. Are even the Best Free PC Games Really Worth it? Want to Resell PC Games You Don’t Play Any More? Good Luck!